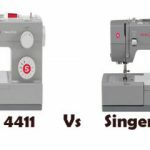 Ever since it was launched, the Singer Stylist 7258 sewing machine has been giving its competition a serious run for their money. 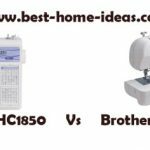 Lots of beautiful stitches, exciting accessories and positive reviews by almost everyone who has ever used it, make this Singer sewing machine a definite winner. Add to it the ease of use, and this machine has quickly become the top choice not just veterans looking for a replacement machine but also for beginners looking for a first machine. Lots of Stitches to Choose From: With 100 built in utility and decorative stitches including quilting and heirloom and 6 styles of 1-step buttonholes, the stitch possibilities are endless. 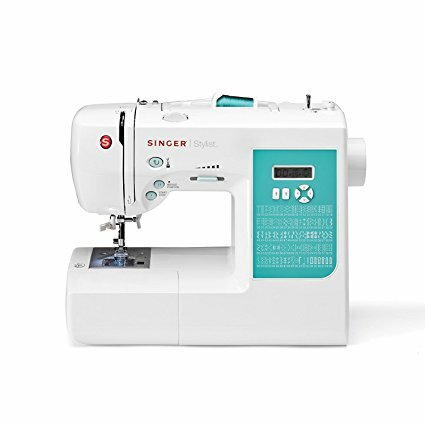 The Singer 7258 Stylist allows you to explore your creativity, whether you are sewing curtains, creating quilts or making fabric sling bags and with a max sewing speed of 750 stitches per minute, you can easily use it for commercial projects too. Balanced, Sturdy Buttonholes: Both sides of the buttonhole are sewn in the same direction so the sides are even and the buttonholes look neat and perfectly balanced. The reinforced corners make them sturdier too. 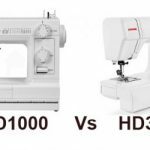 Choosing the Stitch Patterns is Incredibly Easy: The different patterns and their individual selection numbers are printed on the face of the sewing machine so it is not difficult to find what you are looking for. 6 user friendly buttons allow you to select the pattern and control the length and width settings. Convenient Needle Up/Down Position: By programming the machine in the down position, you don’t have to fiddle around to reposition the corners and curves. Just rotate your fabric and the machine does the rest. Leaving the needle down when you stop sewing will also hold the fabric in place so you can take a break for a cup of coffee anytime you feel like without worrying about the fabric slipping off the machine. Start/Stop Button Combined with Speed Control Slide: These two controls allow you to sew without a foot pedal. All you have to do is slide the speed control button to the setting that is most comfortable for you and push the button to start sewing and push it again to stop. 8 Snap-on Style Presser Feet! Yes, that’s right! 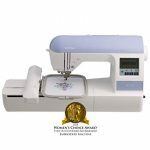 You get 8 snap-on presser feet with the Singer Stylist machine – a general purpose, satin stitch, zipper, overcastting, buttonhole, darning & embroidery, gathering and rolled hem. Having 8 feet is a special treat to someone like me who loves elaborate processes but is too impatient to do them by hand. 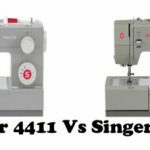 With a bucketful of convenient features and accessories, the Singer 7258 Stylist sewing machine is a great machine for a low price. Most users who bought it, have just 2 words to say about it – Love It!